Should any information written on the scoresheet by the players be accurate? 12.4 The scoresheet shall be used only for recording the moves, the times of the clocks, the offers of a draw, and matters relating to a claim and other relevant data. I believe this rule has been used before, against Wesley So in the 2014 ACP Golden Classic tournament (more here). But, what about this? 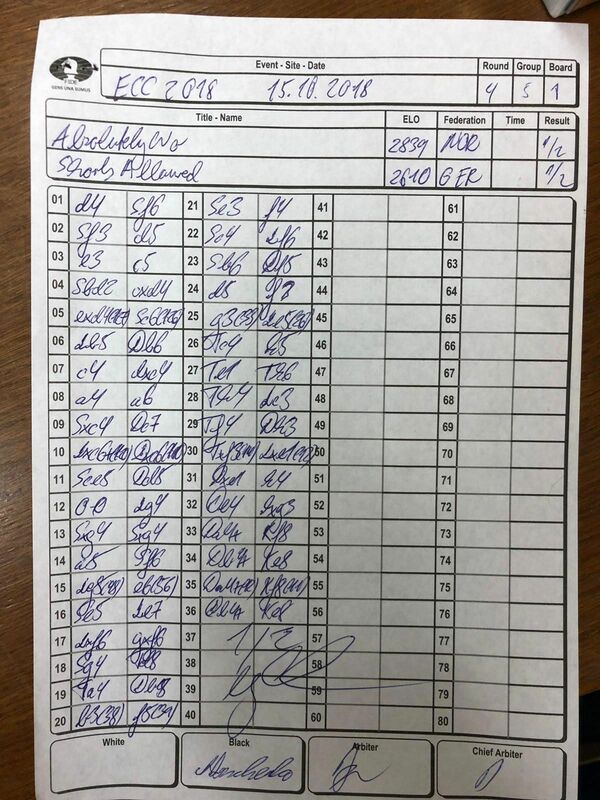 This is Carlsen's scoresheet from his game with Alexnnder Donchenko in the 2018 European Club Cup, where he wrote "Absolutely no shorts allowed" instead of writing his and his opponent's names. Isn't this a violation of the rules? Why didn't the arbiters take appropriate action? It's pretty obvious that his name is absolutely no and his opponent's name is shorts allowed. Not the answer you're looking for? Browse other questions tagged rules scoresheet or ask your own question. FIDE tournament rules: Is a player allowed to scribble notes on the scoresheet while the game is in progress?